Ongoing distributions of supplies provided by Samaritan’s Purse are helping thousands of displaced Iraqi families prepare for winter. Much of the relief was airlifted into the country in mid-October. Many beneficiaries fall into one of two groups: Assyrian/Chaldean Christians who fled from the plains of Nineveh and Yazidis who left areas near the town of Sinjar. People from a variety of Muslim groups are also among those being assisted. Most had only hours or even just minutes to prepare for a hurried escape from violent jihadists in the middle of summer’s scorching heat. Now, with winter fast approaching, they have no jobs, little or no money, and little or no extra clothing. Low temperatures this week are already into the 30s in parts of this region in northern Iraq, which is sheltering around 800,000 people. The displaced are living anywhere they can—usually in schools, tent camps, or unfinished buildings without heat. One recent distribution took place in the rugged mountains outside the city of Dohuk, for 95 Yazidi families who fled Sinjar. They received blankets and clothing from Samaritan’s Purse staff and church partners. The Yazidis are a persecuted Kurdish people who follow a unique syncretistic religion that mixes Christianity, Islam, and Zoroastrianism. Lokman and his brothers and sisters were among the many who received coats. Lokman, 17, and his five brothers and sisters, ages 3 to 13, were among the more than 500 individuals who received winter coats. He said many Yazidi families had relatives killed by ISIS in the initial siege of Sinjar and subsequent exodus. Others were taken captive. Lokman’s family was among those trapped in the mountains for 10 days by ISIS, a crisis that dominated world news in early August. He thanked Samaritan’s Purse for the jackets and blanket, as well as a heater they previously received from us. Hodaida and his family were grateful that someone remembered their plight. 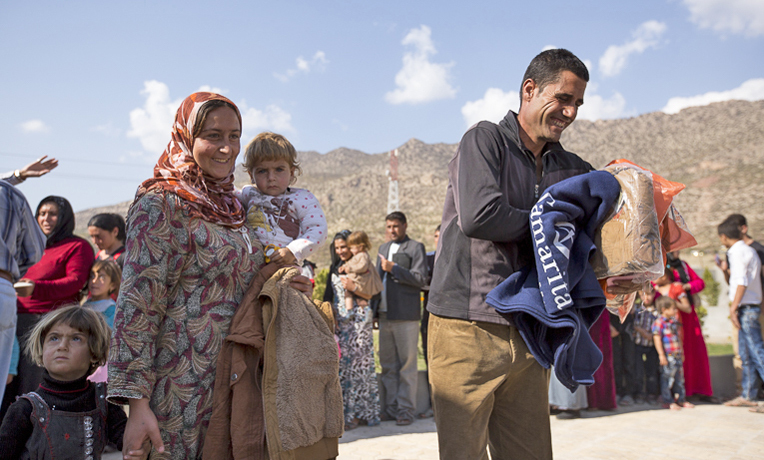 Hodaida, 41, his wife, and five children, ages 7 to 15, also received a large blanket and winter jackets. 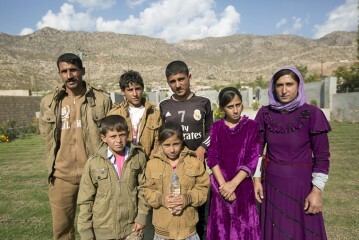 They too are Yazidis who were trapped in the mountains for days by ISIS. For six days, Hodaida said, they had no food and split one bottle of water. Finally, the United States military began dropping food and water to the trapped families. Airstrikes then allowed the Peshmerga (Kurdish fighters) to open an escape route through Syria to northern Iraq. The Yazidis had to walk for hours, under occasional gunfire, to finally reach safety. The distribution that benefitted Lokman and Hodaida and their families was held at a kindergarten in the small, traditionally Christian town where they find themselves today. The kindergarten, which now houses multiple families who have received relief from Samaritan’s Purse after being displaced by ISIS, actually sits a few hundred yards below a crumbling palace of the former Iraqi leader Saddam Hussein. 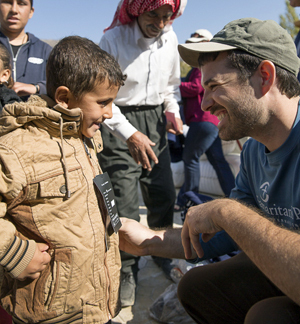 Samaritan’s Purse staff and church partners are demonstrating Christ’s love. The town, originally with about 125 families, now has 600 additional families to care for, said Pastor Samir, the area’s spiritual leader. The needs are overwhelming. There were many infants and small children, as well as the elderly and the disabled, at the distribution. One 11-year-old Yazidi girl was being cared for by her uncle, since ISIS had taken her parents captive in Sinjar. “We thank God for many Christian groups coming to help us,” Samir said. Even Muslims and Yazidis are telling him that without Christian support no one would take care of them. As winter closes in, Samaritan’s Purse will seize further opportunities in this village and surrounding ones, as well as other locations throughout northern Iraq, to demonstrate God’s love in word and deed. 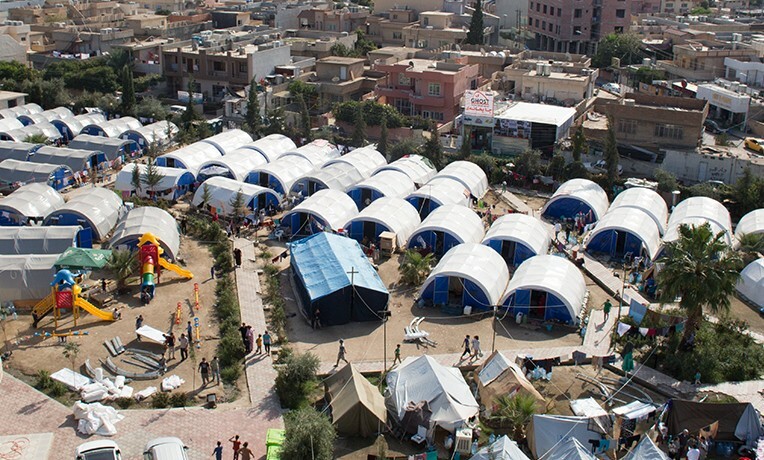 Displaced Christians, Yazidis, and Muslims will all continue to benefit.